Comfortable non-pierced, pierced look Earwrap® for either Ear. It looks pierced, but it's not! Slips on the thin edge of the ear at the top or bottom. NOTE: The Earwrap is tiny! If you want a bigger Ear Cuff, to fit the middle of the ear, order Ear Cuff 9.15SN or 9.2SN or 9.3SN. IMPORTANT! Please view the instructions for how to put Earwraps on, in one of the photos. 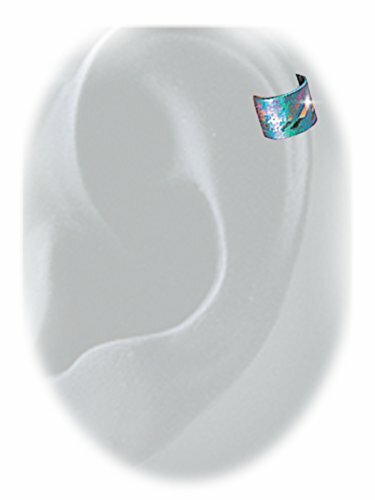 The Earwrap® is great for non pierced ears or as an add on accessory with pierced earrings. The Earwrap® is sold and worn singly. If you want a pair, order 2. Squiggle patterned Teal Green Niobium with flashes of color, is colored with electricity! It will not tarnish or wear off. If you have any questions about this product by Harry Mason, contact us by completing and submitting the form below. If you are looking for a specif part number, please include it with your message.